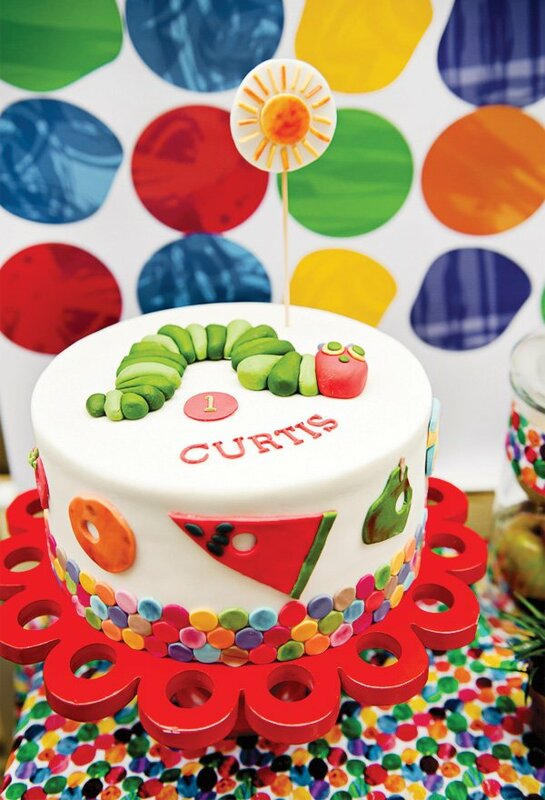 We’ve featured parties inspired by The Very Hungry Caterpillar before, but I always get excited when something something this classic is reinvented! 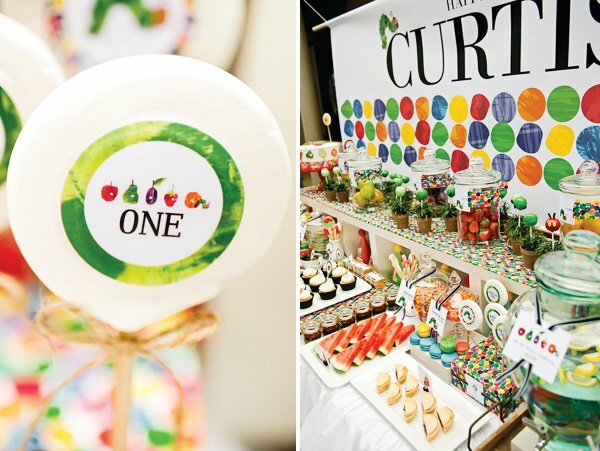 Lily Chic Events brought so many AMAZING details together for this incredible Very Hungry Caterpillar Party – I just can’t get over the ridiculously cute caterpillar cake pops sprouting from mini potted plants! 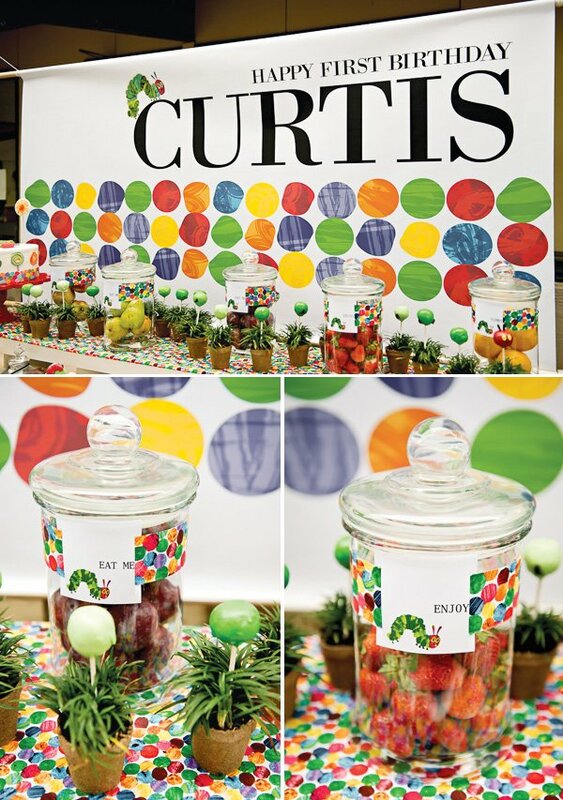 A custom dessert table backdrop that adds a huge splash of color! 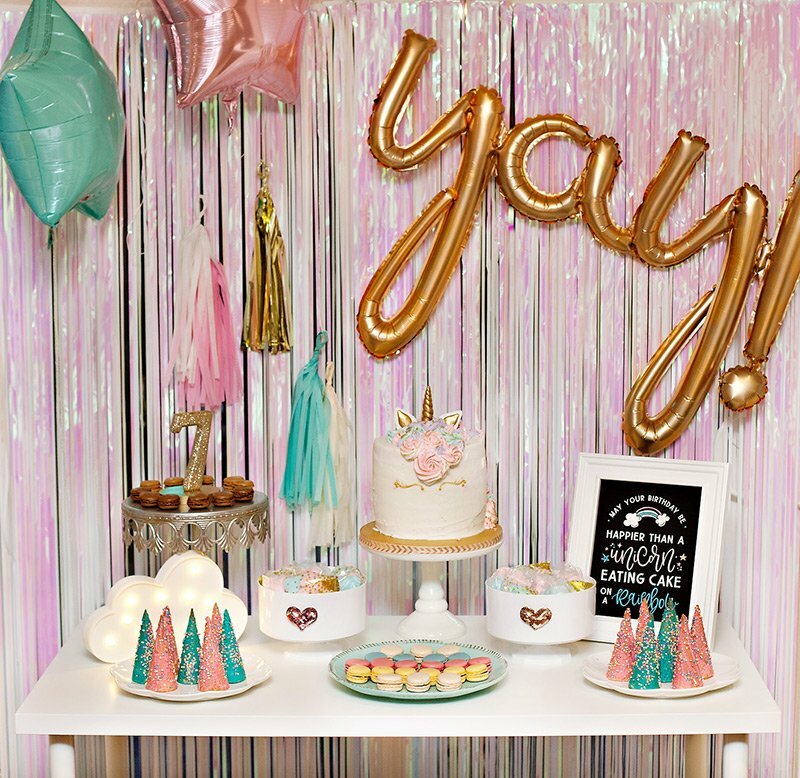 I am a mum of 4 daughters and typically I tend to style girls parties. 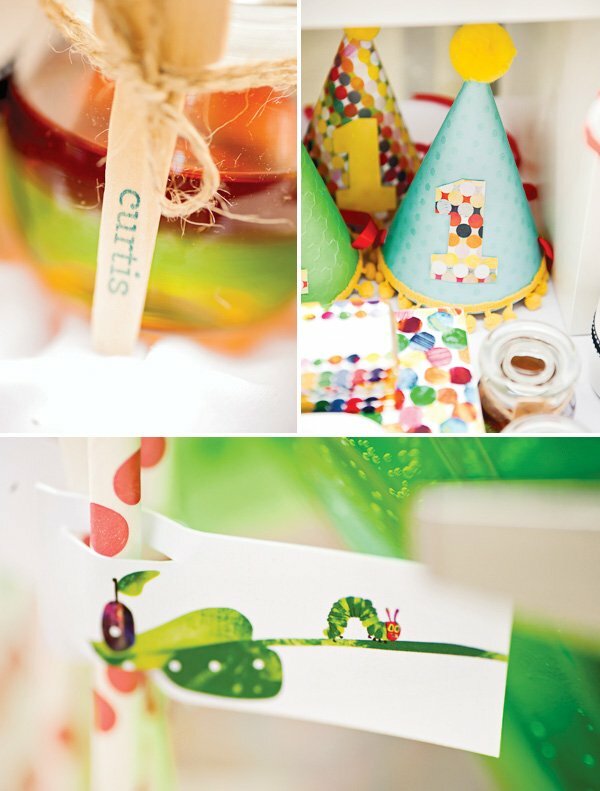 So when my nephew turned one, I was so excited to be asked to style his party… and even more excited when I heard the theme: The Very Hungry Caterpillar! My sister in law Lauren had read this book to my nephew Curtis almost everyday and this was always going to be the theme for his first birthday. Lauren had just started her Cake Decorating business called LOve Cakes and had lots of idea’s on the cake design but the table I had free reign on. 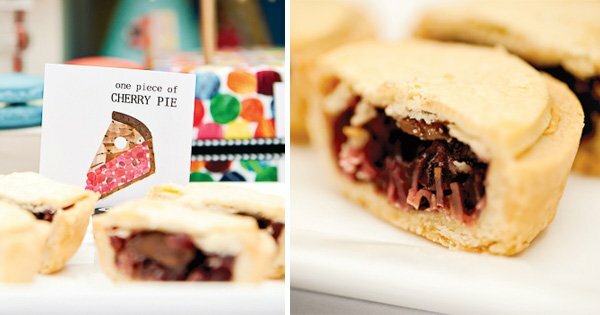 I began by contacting Li-Ann from Ham & Pea Design & Paperie who designed all of the printables including the food labels, invitations, the iron on transfers, chocolate bar wrappers and the straw flags by hand drawing all of the graphics! This took Li-Ann a few weeks but I think they were perfect! 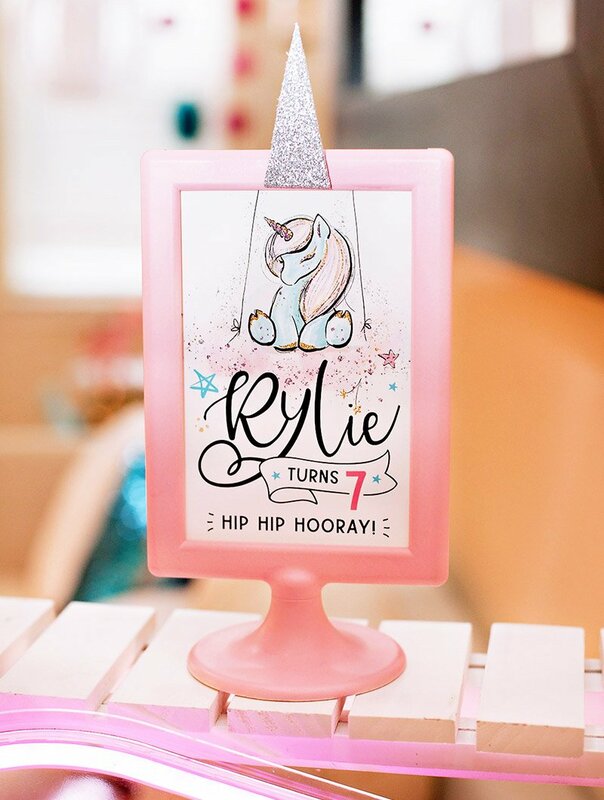 I then contacted Emma from Emma Smith Event Stationary & Styling who designed the backdrop with Li-Ann’s invitations in mind. I focused on the ‘dots’ of the book so it didn’t look too busy and loved the way it all came together. 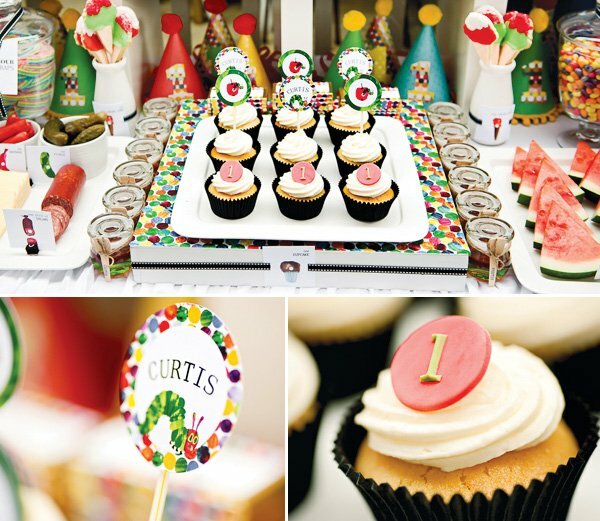 I hand made all of the paper party hats using scrap book paper and hot glue. 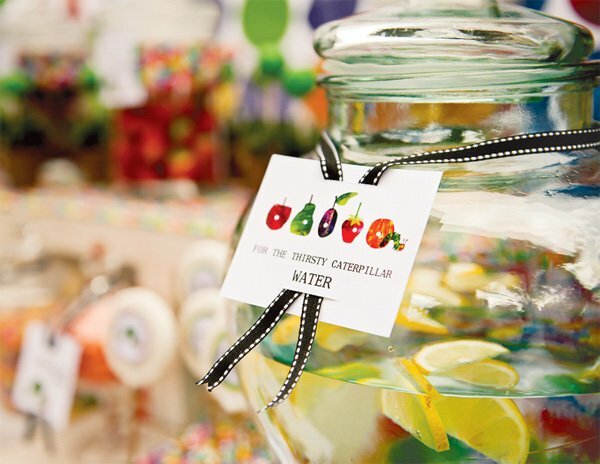 I also stamped the jelly spoons with a Custom Name Stamp from Sweet Style and tied them to the Jelly Pots. The favours were ordered on etsy and came from the U.S. 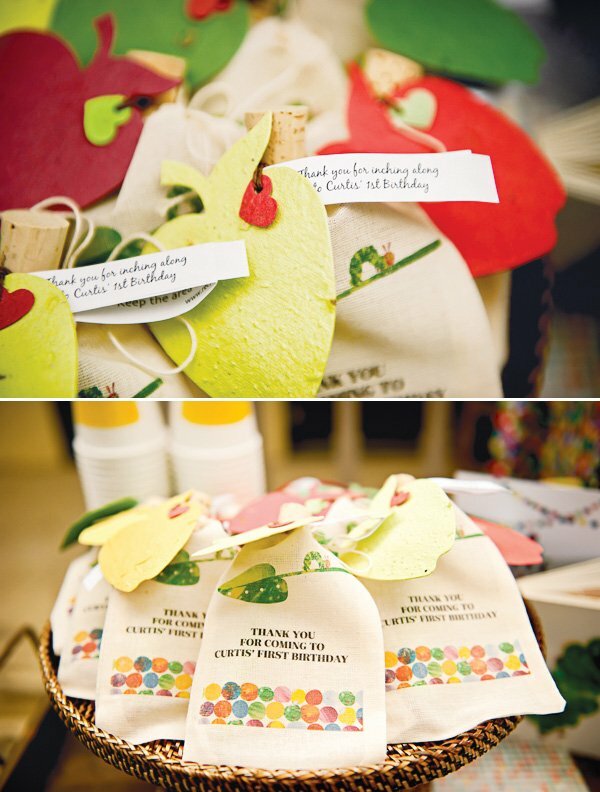 They were paper shaped like an apple and in the paper was flower seeds so the guests could plant the apple paper and watch the seeds flower! 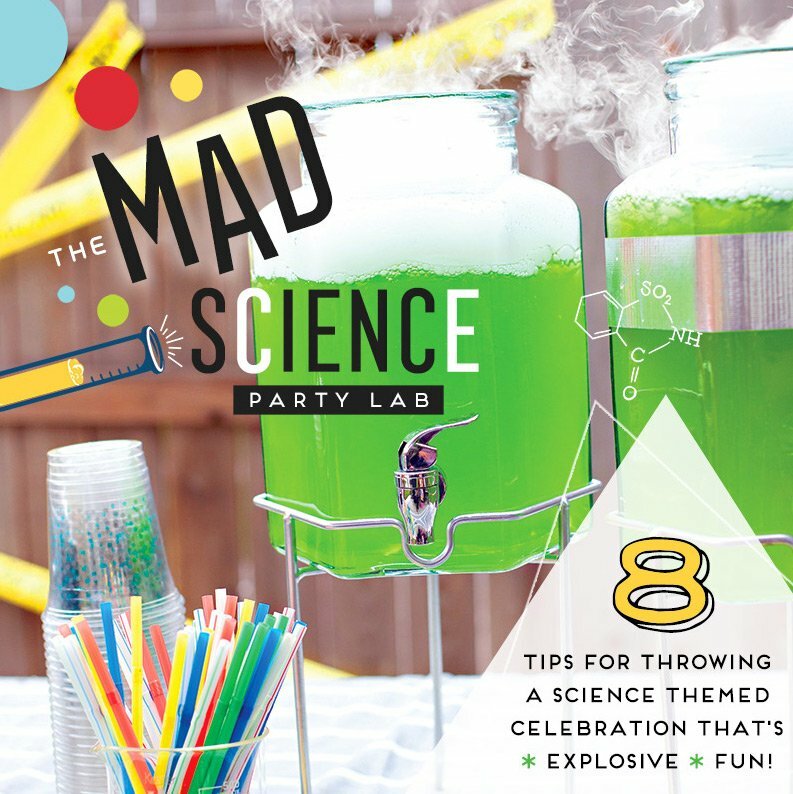 Lauren loved this idea as the smaller guests could also enjoy doing this well after the party was over. 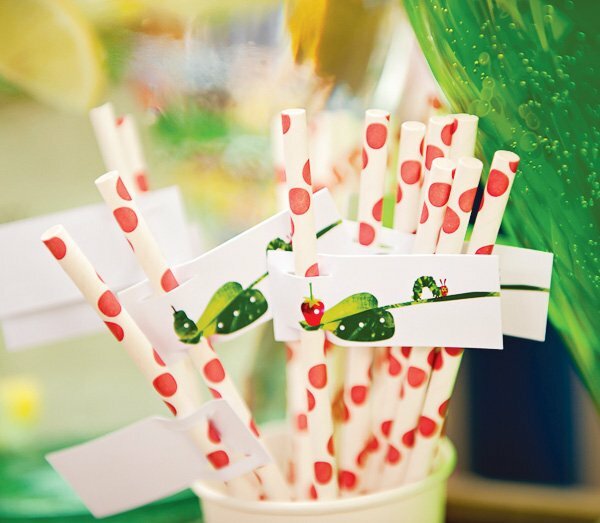 The seeds were tied to a test tube from Test Tube It and inside the tube was one red sixlet and the rest green sixlets that resembled the caterpillar. This was placed in a small muslin bag that I had ironed on the thank you from one of Li-Ann’s designs. We also had a drinks table set up with Green Cordial and Water and each guest was given a paper cup that I had painted with yellow chalkboard paint, so that the guests could write their names on the cups and not lose them. This was lots of fun to watch. 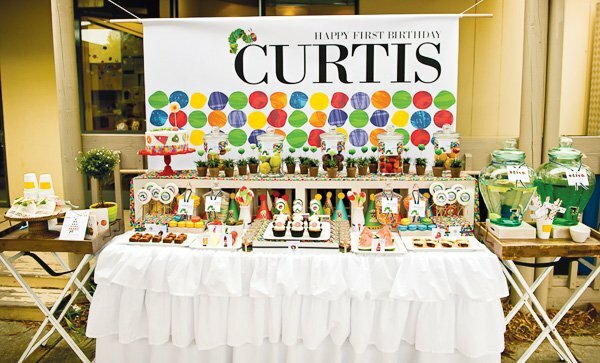 I wanted the cake to stand out so I placed in on a red wooden cake stand above the rest of the food and lined the large round jars filled with strawberries, apples, pears, plums and oranges alongside the cake. These are all the fruits in the book and Lauren wanted to follow the story. 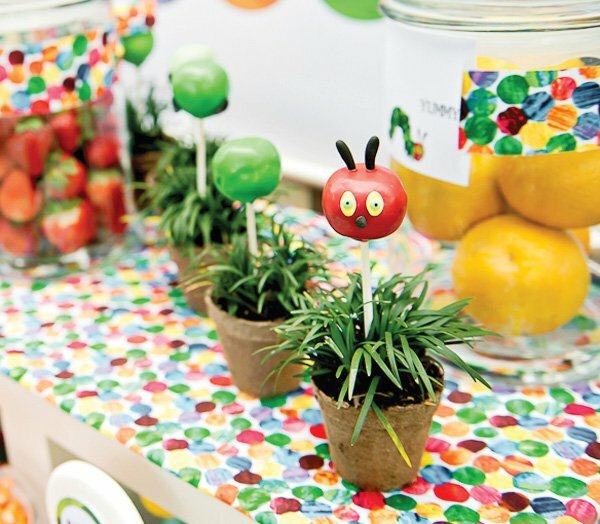 I then planted some mondo grass in small brown paper pots and popped the caterpillar cake pops in each of the pots that wound it’s way around the fruit jars. 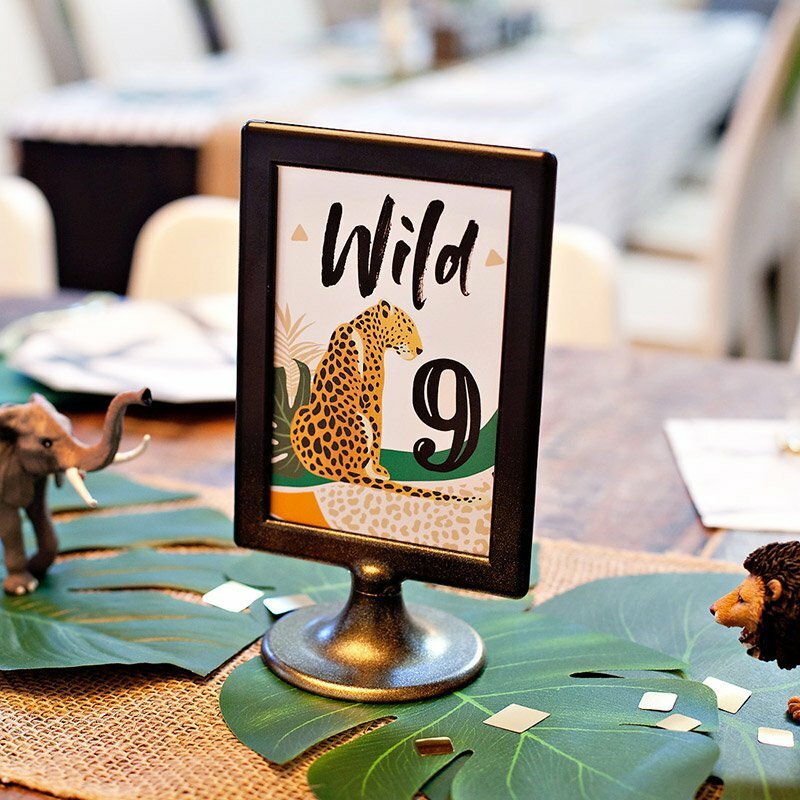 The guests love this and it brought some greenery to the table without needing to use flowers. Lauren supplied the Cherry Pies, Chocolate Cake, Cupcakes and the Birthday Cake which was a chocolate and raspberry mudcake. 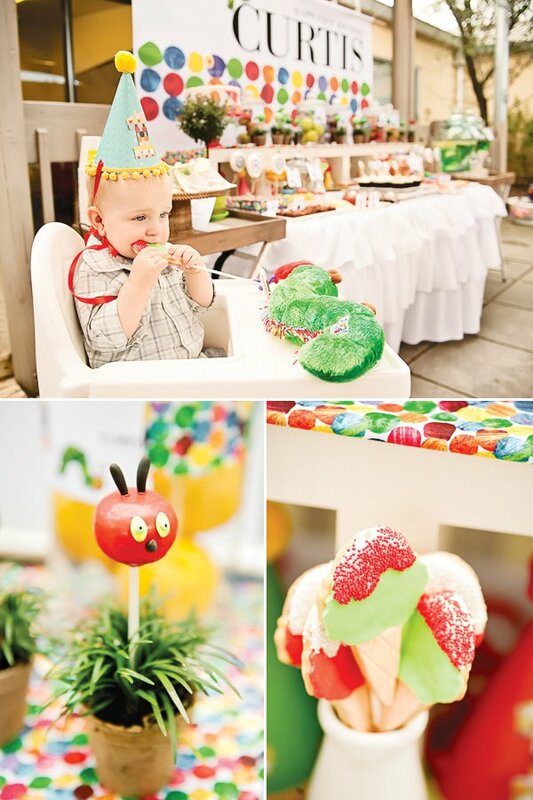 The gorgeous caterpillar ‘oreo’ cake pops and the ice cream cookies were made by Leoni from Just Call Me Martha. 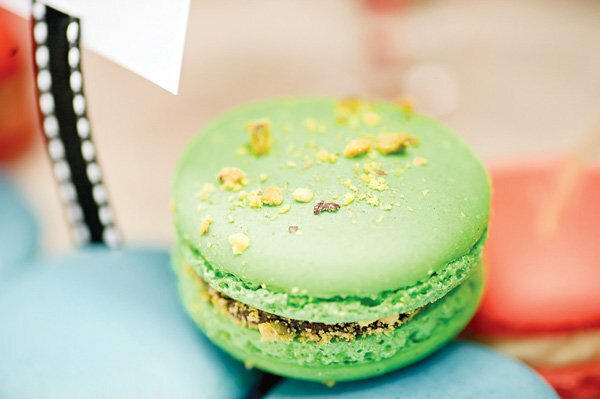 The blueberry, pistachio, raspberry & cream and the mango & passionfruit Macarons were made by Macaroon Moments and were the first things gone from the table! 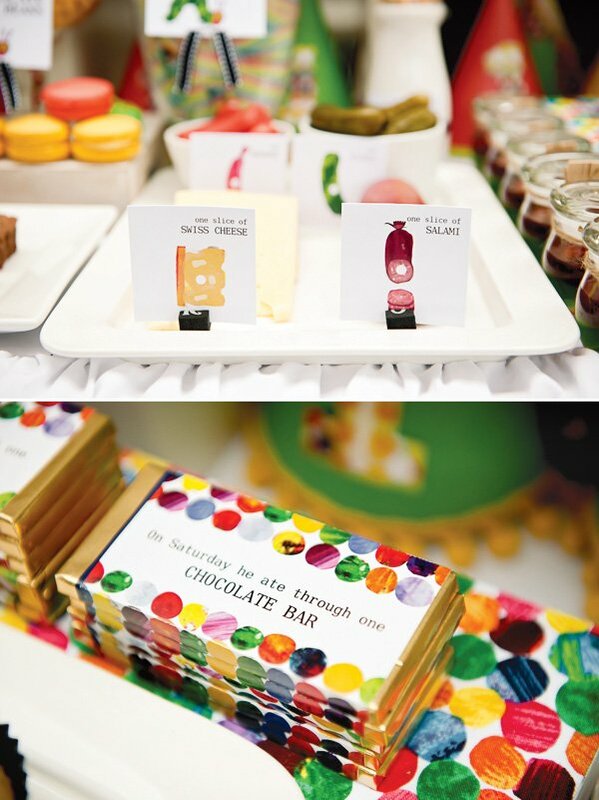 We also had some M&M’s in orange and yellow, some Smoothie flavoured Jelly Belly’s and some Sour Straps for the older children. 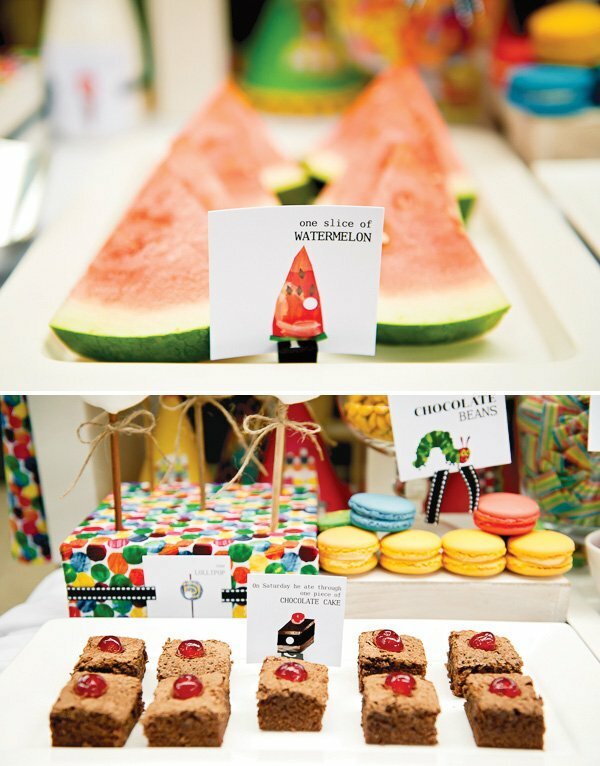 The Jelly and the watermelon was taken by the younger children so it was a nice mixture of foods for all ages. 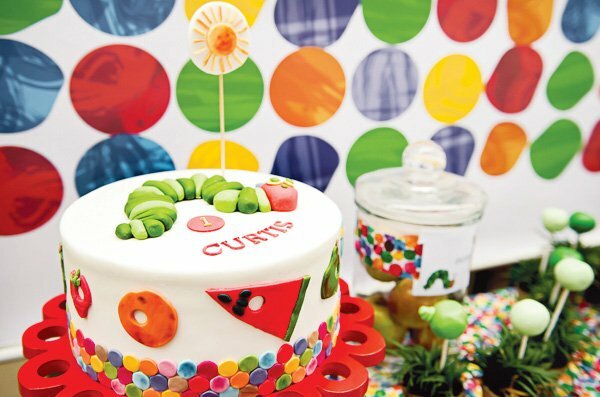 We had a lovely day celebrating Curtis’ First Birthday and know that the amazing pictures taken by Liat from Lee Bird Photography will always bring a smile to our faces. 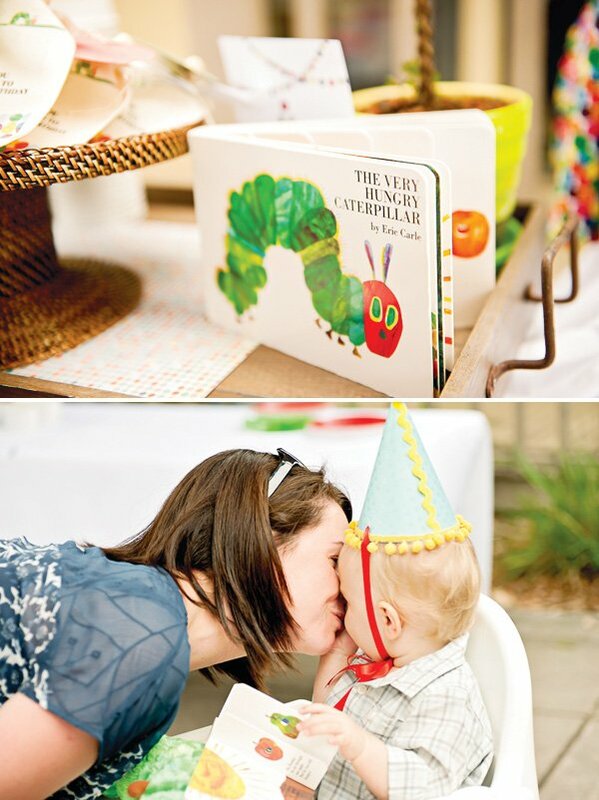 Adorable Hungry Caterpillar 1st Birthday Party! I especially love the food description cards. 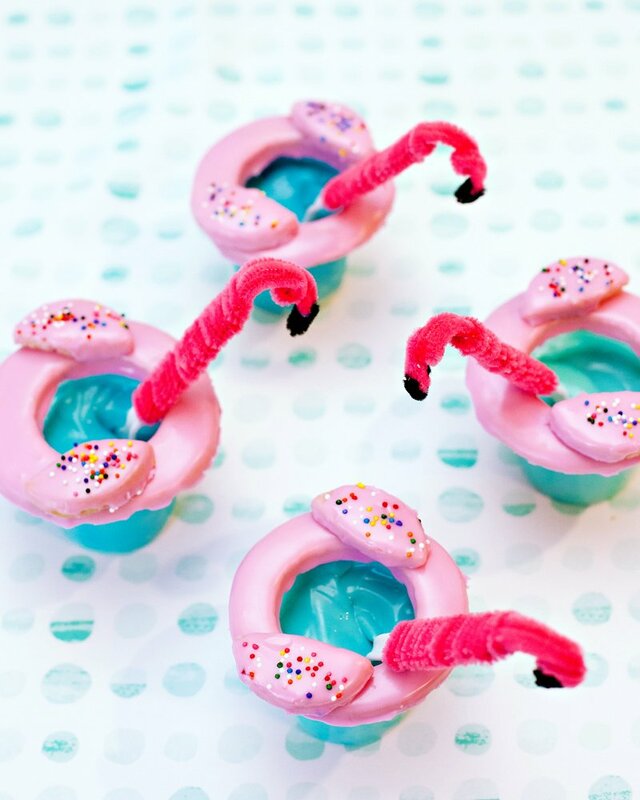 Adorable party!!! love the colors. The cake pops in the pots are so cute!! 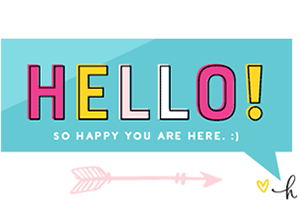 that colorful circle design is really cute! especially when it was done on the choco bar label…. 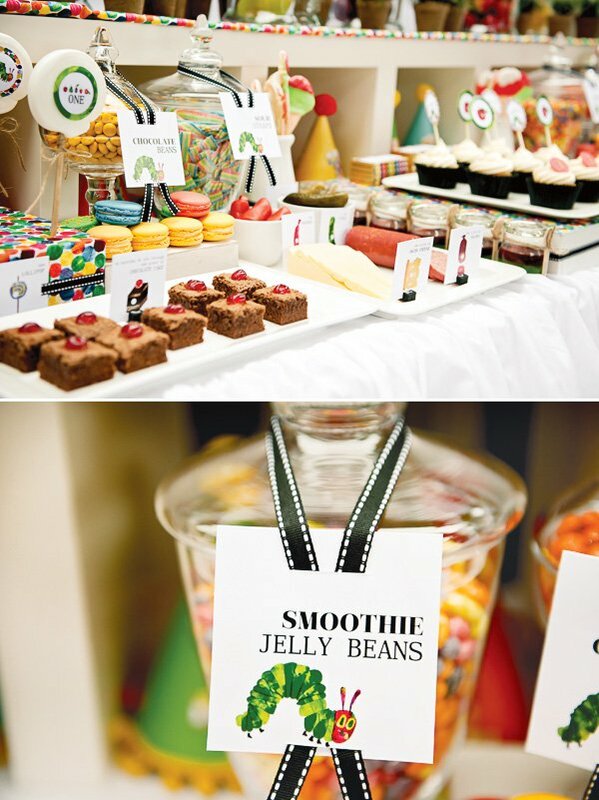 party looked really nice! Love this idea. So much attention to detail! How did you make/where did you get your tablecloth. Hi. Party looks great. Just wondering what chocolate bars you guys used. Been looking for the ones with the foil for my bubs birthday. love this idea..might have to borrow this ;). Did you have any games/ activities for the kids? 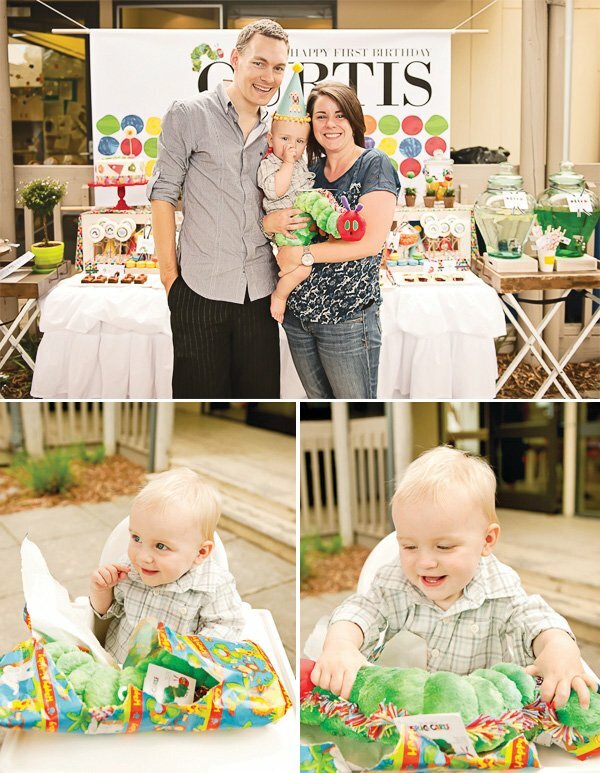 I am doing this theme for my son’s first birthday party and I would like to have the chocolate bars as a favor. What kind did you use to have the wrappers be gold? And where did you buy them? I was able to find only ones with silver wrappers. Thank you!! where did you get the red cake stand?